A new class-action lawsuit has been filed against the U.S. Government alleging damages suffered by “patent holders whose property was taken by the USPTO without compensation in violation of the Fifth Amendment of the Constitution.” Christy, Inc. v. USA, 18-cv-00657 (Ct. Fed. Clms. 2018) (2018-05-09-1-Complaint). The USPTO’s invalidation of the Plaintiff’s and Class member’s patent claims was a taking without just compensation in violation of the Fifth Amendment of the Constitution. The compensation due here includes, but is not limited to, expected royalties and other payments related to use of the patents. This case additionally seeks damages for the Defendant’s breach of contract by failing to maintain in force the subject patent claims for the terms prescribed in the patent grants for the relevant claims, including the recovery of attorney fees expended defending those same patents in post-grant proceedings, any investments made in the inventions underlying those patents, any expected royalties or payments related to the patents, and all fees paid to the Defendant for the issuance of those patents. In the alternative, the case seeks to recover fees that were paid by inventors and patent owners to the USPTO, such fees having been exacted from Plaintiff and Class members through the AIA—according to the Defendant, these patents were issued erroneously by the USPTO in the first instance and thus all fees should be returned to the Plaintiff and Class members. Id. Note here that, although the Supreme Court in Oil States did not bestow patents with full grandeur private property rights — the Court was clear that patents should continue to be treated as property protected by the Due Process and Takings Clauses of the U.S. Constitution. [O]ur decision should not be misconstrued as suggesting that patents are not property for purposes of the Due Process Clause or the Takings Clause. Oil States Energy Servs., LLC v. Greene’s Energy Grp., LLC, 200 L. Ed. 2d 671 (Supreme Court 2018). Overall, it is in interesting idea for a lawsuit, but it lacks precedential support. Its best shot is to focus on the retroactive impact of IPR/CBM decisions on pre-AIA patents. For those cases, the IPR regime was not pre-baked into the implied contract. After a 7-2 Sup. Ct. decision, much of the arguments and tired rants below have the relevance of the famous medieval question of how many angels can fit on the head of a pin. I’m sure most readers are hoping to see realistic suggestions [that do no require visits from the tooth fairy or more hopeless cert petitions] for improving IPRs. Especially since we obviously have a new PTO Director open to rational suggestions. I would tend to agree that IPRs are here to stay. My biggest suggestion would be to make the APJs ALJs so that they are independent from the PTO. The Taft report suggested making the entire PTO an independent agency. Your idea of “relevance” just ain’t so, oh cheerleader of the IPR and Efficient Infringer champion. It is the very same type of pushback that you seek to denigrate that is causing a groundswell against the havoc and weakening of the patent rights that the Supreme Court has engaged in. Take your “just sh u t up” message and with all due respect, cram it. As opposed to endless personal attacks on anyone more interested in legal reality than in cluttering up legal blogs with erronious personal legal fantasies not even presentable in amicus briefs or to Congress? IF you are tired of “endless personal attacks, Paul, maybe stop them yourself. It is your actions that are “tired” and irrelevant. People will gripe over bad decisions, no matter how that makes you feel. It is precisely that griping that creates the pushback for those making the bad decisions to realize that they have made bad decisions. Those who do not deign to actually discuss the items on the merits (such as you) have no room to want quiet after bad decisions are made. 1. Promoting progress in the useful arts has no relevance to a regulated technology franchise market. 2. Securing to inventors the exclusive rights to their discoveries has no relevance to a regulated technology franchise market. 3. The patent quid pro quo has no relevance to a regulated technology franchise market. 4. Invention has no relevance to a regulated technology franchise market. 5. The future of innovation has no relevance to a regulated technology franchise market. Ask Paul the last time he actually helped innovators by engaging in prep and pros. His cheerleading bias is plain to see. Any indication that the decision was a bad one is – by his definition – tired and irrelevant. Now be quiet and go back to innovating for Big Corp. Be thankful for the scraps that they may leave you. After a quick look, I don’t think this is going anyway. Maybe there is some corner argument that might have some hope to survive. Alas, it is i that need be counting spoons when dealing with the positions that you advance Greg (as you advance the same positions regardless of the holes in them that have been pointed out to you). One thing missing from the emphasis on “Franchise” in comparison to “Personal” as a type of property is that the modern day Court’s path TO “Franchise” was through a Public Rights doctrine. A Public Right is the polar opposite of a Personal property right. A Public Right is something that has been attached to (in addition to) the item that traditionally (and since 1952, exclusively) had the attributes of a Personal property right. That attachment – a public’s “Right” (obstinately, to challenge) should be recognized as something distinct, something foreign to the inchoate right of an inventor (as a Lockean concept that has been a foundation of US patent law consistently throughout US history. Quite apart from the spin that Greg wants to impart (that this realization must only come from those wanting to employ a “boogeyman” scenario), understanding this aspect – this change – of the Oil States decision is a must for inte11ectual honesty. Are we forgetting that the patent in the Oil States case WAS just such a patent? The irrelevancy of the Thomas dicta should be excessively clear, as were the Court so inclined, they could expressed the view in a holding that would have yielded a different Ends. While it’s a nobel effort to bring the taking claims – I agreed Thomas’ Dicta – which IMHO – is a small bone that the basis of the ‘claims court’ can continue to exist – is nothing but dicta. The holding, a patent is subject to the public rights doctrine – is a total sea change and means the right is subject to a regulatory scheme, and there is no ‘regulatory taking’ under the public rights doctrine. We will continue to see anomaly after anomaly as the entire patent scheme – up to Oil States – was based on a patent being a traditional property right. As I have pointed out over the last couple of years, there are many “unforeseen” consequences that will continue to unfold. “Oil States” is perhaps yet another example of the judicial branch created patent profanity and/or genesis of traps for the unwary. There is no basis for predicting such widespread draconian changes in patent law from Oil States, which merely narrowly confirmed the right of CONGRESS to pass legislation allowing PTO re-examination of patent claims, which had already been done years ago with the statutory reexamination system and modern interference proceedings. The Oil States decision was hence correctly predicted in advance by most objective legal experts. Where were all the doomsday predictors years before the AIA when the inter partes reexamination statute was enacted? Except for the fact that changes were made BOTH to the manner of review (the AIA mechanism is NOT “just like” the prior mechanisms) and (according to Oil States), the very nature of the patent right. It is entirely disingenuous of you Paul to pretend otherwise. [L]egislative courts and administrative agencies created by Congress [may] adjudicate cases involving “public rights”… In contrast with the private rights at issue in Northern Pipeline, the grant of a valid patent is primarily a public concern. Validity often is brought into question in disputes between private parties, but the threshold question usually is whether the PTO, under the authority assigned to it by Congress, properly granted the patent. At issue is a right that can only be conferred by the government. See Crowell v. Benson, 285 U.S. at 50, 52 S.Ct. at 292. Thus we find no constitutional infirmity, under the analysis suggested by Northern Pipeline, in patent reexamination by the PTO. In other words, the understanding that patent validity (but not infringement) is a matter of “public rights” that can be adjudicated by an Art. I tribunal has been the operative law in the U.S. for at least three decades now. If it has not brought the whole system crashing down around our heads yet, it is hard to see why that should change now that the Supreme Court pronounces this as the law, according to the exact same understanding of the law pronounced back in 1985 by the only circuit court of appeals with jurisdiction over the PTO or the rest of the patent system. This is difficult to accept for folks who have been misled for years by erroneous assertions and predictions, especially on Gene’s blog. LOL – kindly return Malcolm’s 0bsess10n back to him. Except for the fact (as the late Ned Heller oft pointed out, Patlex was poorly – and wrongly – decided. It seems like the takings argument will likely fail because the argument that the patent was invalid at grant and therefore there was no property interest to begin with, is a strong one. What seems like an interesting argument is the idea of reliance interest. Does the government create a reliance interest in the patent after grant. Isn’t every action the Patent owner takes in furtherance of their patent interest done in reliance on the judgement of the Goverment that the patent is valid. The reliance is a good point. Exactly, the reliance interest point is a fair one, which is why the retroactive application of IPRs to pre-AIA patents really does run against constitutional protections of property. Unfortunately, Oil States got greedy. Instead of trying to bring an “as applied” challenge to the constitutionality of IPR against their patent, they brought a facial challenge in the hopes of bringing down the whole system. The question was not asked, but Congress is not free to write whatever they want when it comes to an existing property right. Franchise Patent – there is no takings; it was just a privilege; you had it for a while and now you don’t; get your damages from those that violated your franchise while you had it; the government owes you nothing. Thomas Patent – a dog is a cat; a patent is a franchise; you had a property right but really it was a franchise; since we cancelled your franchise which may have been a property right, but we will never know, you could not have had a property right; but you can can ask Justice Thomas again in a few years if you perhaps you had a property rather than a franchise. Banana Patent – you are a sucker; you traded your secret for a worthless piece of paper; you have no rights unless we say so; if we say it is valid it is valid; if we say it is invalid it is invalid; we are the rulers you are the subject. This class action suit will determine which type of patent we have. Yes, exactly. For as long as we have had patents in this country, they have belonged to that category of intangible property known as a franchise, and every patentee has taken them according to the terms noted above (“you had it for a while and now you don’t… the government owes you nothing”). I wish that everyone could catch on as quickly as Mr. Rights has to the seamless continuity that exists pre- and post-Oil States in the nature of patents as property. Sorry I have not caught on to any such thing. I’m with minority in Oil States, but they lost. I was not suggesting that you agree with that formulation patent rights, merely that you evidently understand in what it consists. That is a darn site more* than can be said of many of the other Oil States critics. * To be very fair, it is not 100% clear to me whether many of these critics legitimately fail to understand what Oil States held, or whether they merely ape—for rhetorical effect—a Chicken-Little style horror at something that would be very bad if the Court had said it, but which the Court did not say. Probably a little bit of both. Very disingenuous of you Greg to omit the fact that the Court HAS said it – and has said several different things in the course of time from the ancient quote that you want to parade about as if context then is the same as context now. That log remains in your eye. If it is a franchise, does that mean that I can still sue you for past infringement even if the court/PTAB today cancels my franchise? Meaning, is it presumed valid until the franchise is terminated? God bless, people. Franchise—in this context—does not mean “I want to open a McDonald’s in Peoria.” Read some Blackstone, for pity’s sake. Greg – you are the one lacking context (wanting some 1800’s version, as if time has not changed the context, and that the Oil States decision was written some 140 years ago or so). Shoot yourself in the foot much, Greg? So now we’re all subjects of a king? Or all patentees are subjects of a king? Greg does not deign to answer counter-points, 6. Courts do not cancel patents. Otherwise I believe your statement is correct for the post Oil States scenario in which we have Franchise Patents. If we have Thomas Patents or Banana Patents then your statement is not correct. There is a bait and switch under way. Mixing up what the judicial branch does with respect to property rights with what the executive branch does with respect to franchises is key to the bait and switch. Courts do not cancel patents. True enough, although properly speaking neither does the PTAB. A court can declare a claim invalid, but the patent continues on in existence even after. Similarly, the PTAB can declare a claim unpatentable (and append a certificate of correction to the issued patent in which the unpatentable claim is axed), but the patent continues on. In other words, once the patent is granted, there is really no mechanism by which anyone (court or PTAB) can take it back. The only things that can be affected are the claims in the patents, not the patents themselves. Compare a patent (yes, the patent) with ALL of its attributes immediately after Grant to one immediately after an institution decision. The difference are the aspects of property that have suffered a Taking. Note that this is a Taking at a specific moment in time and without regard to any further legal developments. One need not wait for the determination from the rest of the post-grant procedures to note that a Taking has occurred. Fine. Claims. The question posed at 10.2 remains. If it is truly a franchise then PTAB can terminate it. And the owner can collect damages for the period it was in effect, unless the accused infringer demonstrates the claims were invalid under section 282. But the guardians of the banana republic will not stand for this. The Supreme Court will rewrite section 282 next time around. What remedy against the government do accused infringers of invalid patents have? By this same logic, the government takes something from the public every time the PTO issues an invalid patent. Must it compensate us all? When an infringement defendant succeeds in invalidating an asserted patent based on written prior art that was not found by the PTO, must the PTO pay all of the defendant’s legal fees? What about defendants who have previously settled or licensed an invalid patent prior to it being found invalid? Must the PTO reimburse all of their licensing costs? For all reasons of invalidity? Who is Billy and what is your point? At least for 102 and 103 where the subject matter was in the public domain, the granting of patent claims that excluded the public from using the subject matter in the public domain, this is the actual taking. The USPTO should have to compensate those in the public that were harmed by the invalid patent claims. As for canceling an invalid patent claim, the invalid claim has no value. Even if canceling an invalid patent claim could be considered a taking, the just compensation would be zero. Good arguments can be made to not include 103, given as elements merely being in the public need not mean that the combination is a combination practiced (and thus possessed) by the public. If I were not also a taxpayer, I would say yes to all of the above. What a complete waste of time this suit is. The patent system is premised on the understanding that your patent “rights” are not irrevocable but instead are free to be challenged. It is understood – before a dime is paid to the PTO – that even if you get a patent, it could later be revoked due to changes in case law or statute, or based on prior art not considered during prosecution, or based on any number of other factors (ex: a claim construction you hadn’t anticipated). They could have easily said your granted patent “IS” valid rather than “presumed” valid. And there are tens-of-thousands of patents sitting in drawers right now, failing to generate revenue streams. Where is that covered in the “contract” with the government? Remember the patent on how to exercise a cat by using a laser pointer? Or the one talking about how to make your swing go side-to-side rather than forward-backward? Those guys clearly deserve some cash! (and their lawyers deserve a contingency fee) There is no requirement or guarantee that a patent will be commercially valuable. The patent system is premised on the understanding that your patent “rights” are not irrevocable but instead are free to be challenged. It is understood – before a dime is paid to the PTO – that even if you get a patent, it could later be revoked due to changes in case law or statute, or based on prior art not considered during prosecution, or based on any number of other factors (ex: a claim construction you hadn’t anticipated). There is this concept you should become familiar with: Ex Post Facto. What, no claims for damages for all those patent claims cancelled for years in reexaminations? Hahaha someone hasn’t learned that the public never pays if it doesn’t have to. The court didn’t say that invalid patents were not property for the purpose of the takings clause, it said that patents were not property for the purpose of the takings clause. The government can’t grant a patent, then (essentially) forcibly reassign it to itself (or to a third party) and not pay. Similarly, it can’t cancel a patent without showing that the patent doesn’t meet the standards of the scheme. That’s not the same as a mistake of law, which confers no property rights whatsoever. A person who has no valid title hasn’t lost anything when it was taken away. There is an action sounding in detrimental reliance that has some bearing, but that would be for the issue fee and possibly for maintenance fees, and the only reason that counts is because it’s such a small amount of money. Just to be clear – there is no outcome in which the government will be paying for the costs of attorneys (presumably on both sides) every time a patent gets declared invalid, either by itself or by a court. You don’t even need to be able to read to figure that one out. A person who has no valid title hasn’t lost anything when it was taken away. This is the rub. If one party to a contract unilaterally declares that the contract is null and void, does that make it is so? If a clause in the contract says that the one party can do whatever it wants, including declare the contract null and void, does exercising such a power truly render it null and void? The USPTO declaring it’s own promise invalid is merely an allegation, or an advisory opinion. They simply cannot be a party as well as adjudicator of the patent contract. Something seriously went off the rails in the legal revisionism of patent rights. It is not sustainable. Really and truly the most that one party can unilaterally do is to terminate the contract. They simply cannot make it vanish as if it never existed. Where does the PTO make a promise or warranty, or whatnot? Where do I find such a promise, orally or written? They simply cannot be a party as well as adjudicator of the patent contract. What contract? I am not clear that the PTO contracts with inventors. They used to in the pre-franchise era. It has also been called a quid pro quo, or the grand bargain. Not sure where it fits in Justice Thomas’ franchise scheme though. The “pre-franchise era”? Do you mean back in the early 1850s, before Bloomer v. McQuewan, 55 U.S. 539, 549 (1853) (“The franchise which the patent grants, consists altogether in the right to exclude every one from making, using, or vending the thing patented, without the permission of the patentee,” emphasis added)? Incidentally, I do not see anything in the text that you quote that resembles either a promise or a contract. Not all quid pro quo exchanges are contractual. Black’s Law Dictionary (10th ed.) defines contract as “[a]n agreement between two or more parties creating obligations that are enforceable or otherwise recognizable at law,” (emphasis added). Neither the PTO nor the inventor come away from the quid pro quo with any enforceable rights against the other. I am more than sure that “grant” was recognizable at law. – and why are you insisting on quoting that 1853 case in light of plenty of subsequent SC cases that conflict with your “new favorite quote”…? Heck are there not even SC cases that say a patent is a monopoly? The transition from a property based patent system to a franchise based patent system occurred during the years 2006 to 2018. Before that patents generally secured to inventors the exclusive rights to their discoveries. Now patents are government favors for the wealthy elite. This talk about valid and invalid is nonsense. A franchise just is or it isn’t. Totally depends on the whims of the sovereign. Now patents are government favors for the wealthy elite. Large, wealthy, elite entities lose patent claims all the time. In re Janssen Biotech, 880 F.3d 1315 (Fed. Cir. 2018); Gilead v. Merck (Fed. Cir. 2018); Raytheon Co. v. Sony Corp.. I do not know where you get the idea that the wealthy are somehow sheltered from invalidation of patent claims. I know where those silly ideas come from, Greg. I think you do, too. Before  patents generally secured to inventors the exclusive rights to their discoveries. This seems to me like rather a precious species of mythical thinking. During the interval between Hothkiss v. Greenwood, 52 U.S. 248 (1851) and the passage of the 1952 act, the U.S. was the locus of enormous (probably unprecedented) technological innovation, despite the fact that “the only patent that [wa]s valid [wa]s one which this Court has not been able to get its hands on.” Jungersen v. Ostby & Barton Co., 335 U.S. 560, 572 (1949) (Jackson, J., dissenting). It has always been the case that the PTO grants far more patents than actually stand up to serious challenge. I would welcome data that proves the contrary, but I would be very surprised to discover that 2006 represents any severe departure from historical norms regarding patents. As to: “It has always been the case that the PTO grants far more patents than actually stand up to serious challenge.” – what is your point? A granted patent means something – again, Greg, what doers “grant” mean to you? If we’re going to continue with the absurd contract analogy, then the Government’s performance is excused on the basis of the patentee’s prior material breach by applying for a patent on the basis of an ineligible “invention” or invalid claims. Except not – as the Grant is the point where the Government buys off on whatever the patentee has submitted. There is no material breach as you have it because it is the Government that does the vouching of the material. Then at best you have a mutual mistake. No, your attempt to slide to “mutual mistake” does not work. IF we merely had a registration system, then maybe you might have a chance at that argument. What exactly does “grant” mean to you, Greg? IF it means nothing, then say so. If it does mean something, then – to you – what is that something? While the overall thrust (of the suit) here is doubtful, one should not simply ignore the fact that the act itself of the grant must mean something. For ALL of the rhetoric about “never SHOULD have been” one simply cannot ignore the FACT of what WAS. …and let’s then resurrect an old meme of my own: IF “grant” means next to nothing, and EVERY ‘grant’ comes with this open-ended, no-fault claw-back mechanism, then why bother at all with examination? Why not save Billions (yes, that’s a “B” tied into that “front-end” process that apparently is totally unconnected with the POST-grant process), and just go to a registration system? After all, anything worth fighting over anyway is going to see its “better” challenge in either the Article III or the non-Article III post grant mechanisms, right? Heck, I would even throw in there the loss of the clear and convincing level of presumption of validity. Leastwise, THIS would be a more honest system than pretending that the act of “grant” has the meaning that the system previously intended. If one party to a contract unilaterally declares that the contract is null and void, does that make it is so? That’s not the situation you have here. It doesn’t matter, as the lawsuit says, whether the examiner has the ability to bind the office. The question is if the office has the ability to bind the government. The office can only grant patents to certain things – things which meet the standards set forward in the statutory scheme. The fact that BOTH THE OFFICE AND THE APPLICANT were mistaken about the legal status of something just renders the “contract” (to the extent it is a contract) a nullity. The situation is more akin to “You and I contract to sell a slave, can one of us unilaterally declare that the contract is null and void?” The inaccurate but close answer to that is “Yes.” The more accurate answer is that the contract could never have been formed in the first place. If you give me money to purchase said slave, I guess you have an argument for getting your money back (assuming you don’t have unclean hands in the issue), but for all of us wanting to contract we lack the ability to contract over the subject matter. That’s nothing more than a mistake of law that both parties bear. The USPTO declaring it’s own promise invalid is merely an allegation, or an advisory opinion. I mean, you could try that argument. Try suing someone on a patent the USPTO cancelled and see if the federal circuit will uphold that argument. I don’t think you’ll get very far. Again, what you’re talking about here is not patent rights, any more than you would have rights to your slave. There is no “there” there – it is ephemeral. You can’t form a contract over something you can’t legally do, so there is no right that is being lost. I think that the point about getting your money back is not insignificant though. You bring up the point that the Office and Applicant have both made a mistake of law over the ability to contract the subject matter. Consider that the Examiner a Government Official whose job is to examine the subject matter. In mistake of law is there not a reliance defense for individuals who act on mistakes of law made by Government Officials. So if this is akin to a mistake law shouldn’t the patentee be attributed a reliance interest in the validity of the patent? They were not mistaken. Misconstruing terms, denying discovery, removing factual disputes from the jury, involuntary arbitration, conducted by technically and legally unqualified agency employees, culminating in a speculation that the invention “would have been obvious to try [20 years ago] with common sense” does not demonstrate by any stretch that the patent does not meet the statutory requirements. Rather it simply means that the franchise was terminated. This seems a strange gripe to level at the PTAB. We can quibble at whether any given APJ is qualified enough to assess the obviousness of a given claimed invention, but there is not a single APJ in active service who is not 1000 times better qualified for the task than 99.5% of the federal judiciary. They may not be perfect, but they are much better than the alternative along this particular dimension. That entirely depends on what their mission is – and what their marching orders are. Knowledge in the wrong hands – or used for political purposes – may be infinitely worse than ineptitude in the hands of a neutral party. Great, file your winning amicus brief. I see this whole situation as a consequence of the gubmit not having the balls to decide both in the past, and in the now, what patents are actually going to be, forever and always absent change by the congress, and the issuing of patents taking place as an entitlement. All coupled in with insufficient protections for those patents in the instance that they so chose to make them property during IPR proceedings. And also them not having the balls to just cut the bs in patent court trials and make them affordable to people so that people could just go to the article 3 courts to have bad patents invalidated. I can agree that the retroactive aspect is the best argument. At the point that they are arguing lost revenue streams, as in the quotes above, they are really straining. When a claim is declared invalid in court, the patentee also loses a revenue stream. Is that also a “taking” requiring compensation? Was Myriad Genetics due just compensation? Ridiculous argument, Article III invalidation has been a “known” for as long as US patents have been granted. When you start talking about “known” channels of invalidation, you are getting at the retroactive aspects of IPR as applied to pre-AIA patents (obviously there can be no question of unjust retroactive application of IPRs to AIA patents, because there the patentee applied with full knowledge of the potential for IPR challenge). As I already said, I agree that the retroactive aspect of IPRs is troubling. The argument from loss of revenue stream is just a red-herring. The patentee whose claims are tanked in court is just as much out of a revenue stream as the one whose claims are tanked in IPR, so the loss of a revenue stream cannot possibly qualify as a taking. I realize that the loss of the revenue stream is the part that irritates these challengers, but that does not actually make it the part that is legally infirm. If one wants to win a challenge, one needs to focus on the real legal infirmity, not just the aspect of the system that happens most to irk the challenger. The answer of course is that there is NO guarantee of any revenue stream. Patents are a negative right, and that nature (if that nature still exists – who knows with this brand new world of Franchise Rights) just is NOT a guarantee of market rewards (here too, the proper distinction – in context – with another word that the Court has used to describe patents: monopoly). The so-called “patent monopoly” DOES sound in the attempted thrust here (by those bringing the suit). What about a fact pattern (some exist in noted cases) where a patent was deemed valid and infringed in Federal Court (and appeal) and invalid at the PTAB under the same art/grounds. The delta was the standard applied by the PTAB verses Court. In such a case, would the lost revenue stream damages be appropriate in your opinion (if the takings argument found to have merit in general) ? My initial answer is “no,” but really I am not sure that I understand the point that you are trying to make. Why, in your understanding, should the additional wrinkle in the fact pattern make a different that a court had sustained a claim that the PTAB subsequently cancelled? Thanks for responding. My point is that the granted case was legally considered valid and enforceable under the law. The defined scope of the property right and its enforceable was confirmed by a court. I’ll call this validity Scope One – so Under Validity Scope One, the patent was always valid. Then, a new progress existed that redefined the “scope” of a valid patent. The second scope is less than the first – due to the different standards applied by the PTAB. The government allowed this different scope, which I’ll call Scope Two. The only reason the patent was invalidated is that it legally sat somewhere between the Scope One and Scope Two. So, my thought is the vested right in the patent was previously legally valid when assessed against Scope One. Subseuqent to the patent grant, a new invalidation scope (Scope Two) was established. The only reason the patent was invalidated, was because the act of congress permitted a change in the property right (so that it could now be for fitted if it fits between Scope One and Scope Two), while the vested right would always have been valid under Court procedures (which apply Scope One). Hence, a taking occurred of all patents situated between Scope One and Scope Two. I am afraid that you have lost me completely. I really do not know what you mean. Brian, let’s keep working on this. Greg is a good sounding board as I think his incomprehension is representative of the industry. It seems to me that the industry has been jaded from careers filled with word games, monetization, and tactics by both patent owners and infringers. No patent is valid or invalid ontologically under the statute. It is only whatever the lawyers can succeed in shaping it into. And there is no res judicata. Jury verdicts mean nothing. District court entry of final judgment means nothing. Even Federal Circuit affirmance means nothing, if there is a pending PTAB trial. And injunctions – what does that have to do with patents? 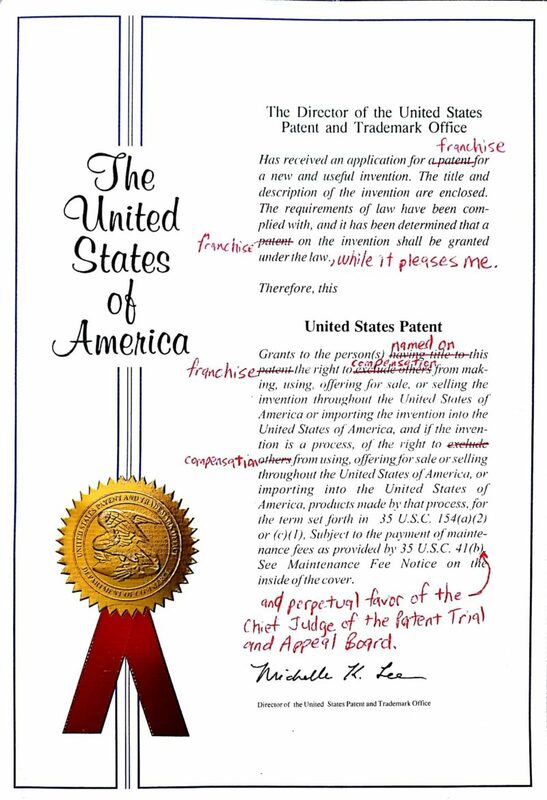 The idea of a settled title to a patent right is foreign to the modern patent bar. There is no way they are going to acknowledge a patent is valid. The saying that the only valid patent is one the Supreme Court has yet to rule on is no joke. In fact even that would not settle it as folks like Greg believe that another party could challenge the same patent again, even with the same prior art, merely by hiring a new expert to opine on obviousness. When the PTAB revokes such a patent these people will with a straight face say the patent was a mistake and was invalid all along. I think many of them truly believe this is what patents have always been and the protests, grievances, and class action suits really are baffling to them. There is no way they are going to acknowledge a patent is valid. I hope that you do not mean this to describe me. I cheerfully affirm every day—and twice on weekdays—that some patents are valid (especially the ones that I draft) and some are not (especially the ones asserted against my clients). In fact even [the Supreme Court] would not settle it as folks like Greg believe that another party could challenge the same patent again, even with the same prior art, merely by hiring a new expert to opine on obviousness. Er, yes. I do believe that. I would like to think that every bar-admitted lawyer believes that. The fact that Party A makes a hash of a particular argument does not always bespeak the lack of merit to the argument, when it is presented competently by Party B. Mind you, as I said above, I happen to think that some patents (many in fact) are valid. Therefore I expect some arguments for invalidity to fail, no matter how well or how often they might be reprised. When the PTAB revokes such a patent these people will with a straight face say the patent was a mistake and was invalid all along. Sometimes I say that. Other times I say that the patentee was robbed. I thought, for example, that Judge Newman’s dissent had the better end of Merck & Cie. v. Gnosis SpA, 800 F.3d 829, 839 (Fed. Cir. 2015). Well, yes, many of us believe that because it happens to be true. Read Graham v. John Deere Co., 383 U.S. 1 (1966) some time. That patent came before the SCotUS from a circuit split—it had been sustained as valid in Missouri, but struck down as invalid in Texas over the exact same art. In other words, the phenomenon of different tribunals looking at the same patent in view of the same art and coming to different conclusions is not one of uniquely recent vintage. This sort of thing has been going on for a while, both before and after the 1952 act. Some of us ascribe real meaning to 35 USC 282: A patent shall be presumed valid. And yes, this is NOT the same as “quiet title” per se. But with a Clear and Convincing level of the standard, it was meant to be as close to “quiet title” as possible. The US system has been under a heavy onslaught against this notion (from interior and from abroad). That WAS no joke (from an historical reference) either. That really was a self-made description of the anti-patent Supreme Court of the 1930s and 1940s – which directly resulted in Congress waking up and taking action in the Act of 1952. Whether or not they “truly believe” simply does not make it so. Further, their positions advanced in “defense” of their feelings/beliefs are full of holes. It is no mystery why counter points go unanswered. Its best shot is to focus on the retroactive impact of IPR/CBM decisions on pre-AIA patents. For those cases, the IPR regime was arguably not pre-baked into the implied contract. How about the notion that once deemed property, even the ability of Congress to change and ADD anything else to be “pre-baked in” is limited by other protections under the Constitution?